The word polynomial means many terms (literally, many names). In modern usage, however, this expression includes monomials (one term, such as 5 or 3x or -7x³), binomials (two terms, such as x² – 3 or 2x³ + 9x), and trinomials (three terms, such as x² + 5x – 3). Each term can have more than one variable, but each variable may only have a power that is a natural number (0, 1, 2, 3, …). No other functions are allowed. So, terms such as -4x³, 7xy², and 9zy³z²/7 are all valid terms (think of them as the ‘nomials’ of which you may have ‘many’). Because most of the material on this page is designed for high school (and some early university) use, I will be restricting my usage, mostly, to using one variable, so I will be writing of y being a function of x [y = f(x)] or of y being a polynomial in x [y = P(x)]. 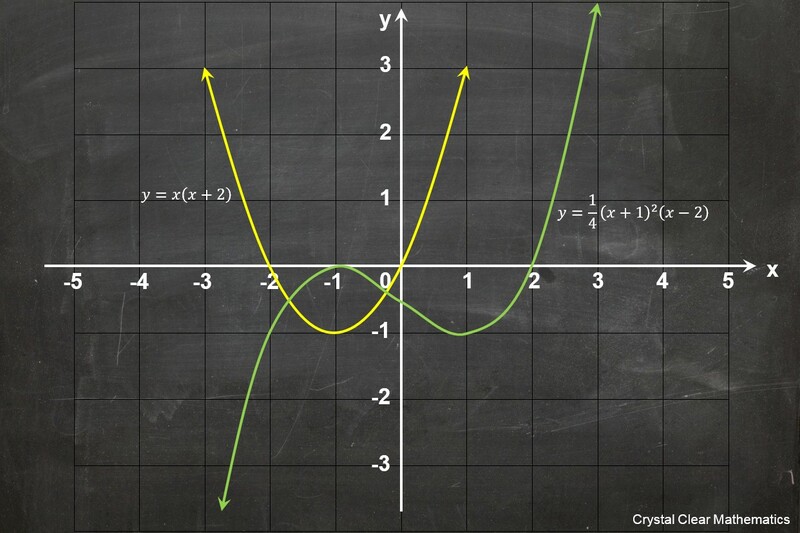 The examples to the left, where you see the graph of a quadratic and a cubic equation, will be typical. When expressed in this way, such polynomials are also functions. In other words, for any given x value, there is only one y value. These polynomials also have some very nice properties, as we shall see. All these things make them easier to study than other curves, but they still have some nice surprises in store for us! Please note that I am aware that there is a difference in meaning between indeterminates and variables but, for ease of use, I will use the term variable because that is what most high school students will be familiar with. It is difficult to pin down when this term was first used. Mathematicians had been studying them for many years, but without using this particular term to describe the entire collection. There are claims that the term polynomial was first used by the brilliant Franch mathematician, François Viète (1540-1603), but I have been unable to validate them (please see the first drop-down item below). As a more formal definition, a polynomial in one variable (or, more correctly, indeterminate) can be written in the form where are numbers, being elements of a ring, so that the normal four operations (addition, subtraction, multiplication and division) apply to the variable/indeterminate, the coefficients, and the terms. The graphs of polynomials of this kind form a particular family of curves which share some interesting characteristics. At various times, as you study this material, you may with to refer to a useful site I found which provides a lot of information about the History of Polynomial Equations. Dr Rick at The Math Forum ~ This is, by the way, a very worthwhile site to visit! Mathematics Department at Tsing Hua University in Taiwan (Last revision: July 31, 1999) and what appear to be two duplicate sites, Jeff Miller's Site (Last revision: March 28, 2014 ~ click here for his Front Page) and Luigi Gobbi's Site (click here for his Front Page) ~ The information on these sites if wonderful and I have visited Jeff Miller's site on a number of occasions with great benefit. I am not sure which site posted their information first. Another site, belonging to Pat Ballew contains similar useful material (click here for his Front Page). 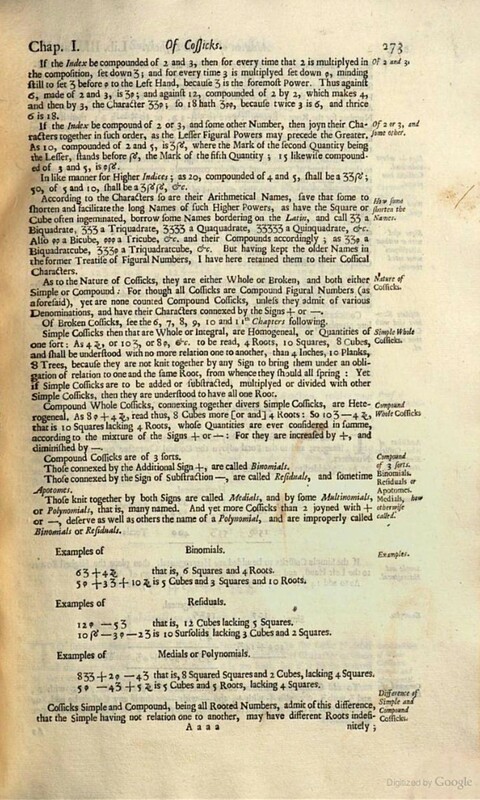 They also observe that the word is (first) found in English in Samuel Jeake's (1623-1690) Arithmetic (1674): "Those knit together by both Signs are called ... by some Multinomials, or Polynomials, that is, many named." They all provide a reference of OED2 (second edition of the Oxford English Dictionary). As I mentioned above, althought Viète certainly worked with polynomials, I cannot trace any reference that he called them by that name. I managed to find an online copy of Florian Cajori's (1859-1930) book, A History of the Conceptions of Limits and Fluxions in Great Britain, from Newton to Woodhouse (1919), but could not find any such reference on page 139 or anywhere else in it. So, I remain puzzled. 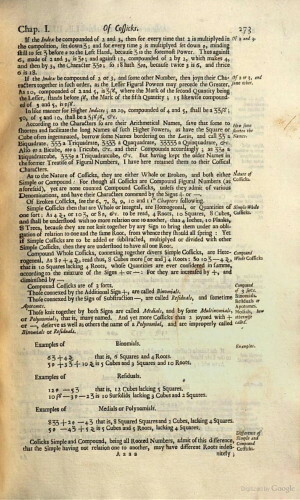 The reference for the first use of the word polynomial in English (identified by the Oxford English Dictionary) was much easier to trace. Although I could not find a reference to a 1674 publication, Wikipedia states that Jeake's principal work was Arithmetick Surveighed and Reviewed published in four books in 1696. You may view the relevant page 273 (see right) via Google Books (and may download a PDF copy of the entire book by clicking on the [EBOOK - FREE] button). I also located a facsimile of his 1701 book, A Compleat Body of Arithmetick in Four Books (again via Google Books), which is actually the same publication. A facsimile of this 1701 publication is available for purchase if you so desire.